« When did life start on Earth? The fact that scientific research has made immense progress over the past years, decades and centuries is taken for granted among professional scientists and most of the lay public as well. But there are others, from both the left wing and the right wing of society, who question, dismiss or even reject the notion that science progresses. One group, which is mostly rooted in the right wing of society, rejects the scientific consensus on evolution, as with the creationism and intelligent design movements, or the scientific consensus on global warming. The other group, namely the “postmodern science studies” movement, which is mostly rooted in the left wing of society, questions, in a very fundamental sense, whether scientific research even uncovers truth at all, much less progresses to an ever sharper view of nature. Much of today’s postmodern science studies literature is rooted in the writings of Karl Popper and Thomas Kuhn, although the postmodern writers go much further than either Popper or Kuhn. British economist and philosopher Karl Popper was struck by the differences in approach that he perceived at the time between the writings of some popular Freudians and Marxists, who saw “verifications” of their theories in every news report and clinical visit, and the writings of Albert Einstein, who for instance acknowledged that if the predicted red shift of spectral lines due to gravitation were not observed, then his general theory of relativity would be untenable. Popper was convinced that falsifiability was the key distinguishing factor, a view he presented in his oft-cited book The Logic of Scientific Discovery [Popper1959, pg. 40-41]. His basic view is widely accepted in modern scientific thinking. In the 1970s, Thomas Kuhn’s work The Structure of Scientific Revolutions analyzed numerous historical cases of scientific advancements, and then argued key paradigm shifts did not come easily [Kuhn1970]. As a trained scientist, Kuhn was able to bring significant scientific insight into his analyses of historical scientific revolutions. Unfortunately, his work includes some very dubious and immoderate analysis, such as at one point where he denies that paradigm shifts carry scientists closer to fundamental truth [Kuhn1970, pg. 170], or when he argues that paradigm shifts often occur due to non-experimental factors [Kuhn1970, pg. 135]. For one thing, Kuhn’s “paradigm shift” model has not worked as well in recent years. As a single example, the “standard model” of physics within just a few years completely displaced previous theories of particle physics, after a very orderly transition [Tipler1994, pg. 88-89]. “The validity of theoretical propositions in the sciences is in no way affected by the factual evidence.” [Gergen1988, pg. 258; Sokal2008, pg. 230]. “The natural world has a small or non-existent role in the construction of scientific knowledge.” [Collins1981; Sokal2008, pg. 230]. “Since the settlement of a controversy is the cause of Nature’s representation, not the consequence, we can never use the outcome — Nature — to explain how and why a controversy has been settled.” [Latour1987 , pg. 99; Sokal2008, pg. 230]. “For the relativist [such as ourselves] there is no sense attached to the idea that some standards or beliefs are really rational as distinct from merely locally accepted as such.” [Barnes1981, pg. 27; Sokal2008, pg. 230]. “Science legitimates itself by linking its discoveries with power, a connection which determines (not merely influences) what counts as reliable knowledge.” [Aronowitz1988, pg. 204; Sokal2008, pg. 230]. In a curious turn of events, these postmodern science writers, by undermining scientists’ claim to objective truth, have unwittingly provided arguments and talking points for the creationism, intelligent design and climate change denial movements [Otto2016a; Otto2016b]. In a recently published interview of Kuhn by Scientific American writer John Horgan, Kuhn was deeply upset that he has become a patron saint to this type of would-be scientific revolutionary: “I get a lot of letters saying, ‘I’ve just read your book, and it’s transformed my life. I’m trying to start a revolution. Please help me,’ and accompanied by a book-length manuscript.” Kuhn emphasized that in spite of the often iconoclastic way his writings have been interpreted, he remained “pro-science,” noting that science has produced “the greatest and most original bursts of creativity” of any human enterprise [Horgan2012]. While philosophers and postmodern writers may debate whether science fundamentally progresses, what are the facts? Even after properly acknowledging the tentative, falsifiable nature of science as taught by writers such as Popper and Kuhn, it is clear that modern science has produced a sizable body of broad-reaching theoretical structures that describe the universe and life on Earth ever more accurately with each passing year. Keep in mind that each year approximately two million new peer-reviewed scientific research papers are published worldwide [Ware2012]. This rapidly expanding corpus of scientific work is an undeniable testament to the progress of modern science. Relativity. In 1905, Albert Einstein published what is now known as the special theory of relativity, which extended the classical Newtonian physics, a theory that had reigned supreme for over 250 years, to the realms of very fast moving objects and systems. Then in 1917, Einstein’s theory of general relativity further extended the theory to accelerating systems, and in the process explained gravity and a host of other phenomena in a very mathematically elegant framework. Relativity has now passed a full century of the most exacting tests, including measurements of the change over time in Mercury’s perihelion motion, measurements of the periodic changes in frequency of binary stars (which agree with theory to astonishing precision), predictions of exotica such as gravitational lenses and black holes, and, in the process, has pushed aside several other competing theories [General2019; Leach2018]. Today’s GPS technology crucially relies on both Einstein’s general relativity and special relativity, and if either of these theories were in error to any significant degree, the entire GPS system and applications that rely on it would quickly fail [Global2019]. Quantum physics. Another 1905 paper by Einstein proposed that light shine in discrete packets, now called “quanta,” rather in continuous beams. Subsequently physicists such figures as Max Planck, Niels Bohr, Paul Dirac, Werner Heisenberg and Erwin Schrodinger developed what is now known as quantum physics, which governs phenomena at the submicroscopic realm. Quantum physics has also passed a full century of the most exacting tests imaginable, from confirmations of the perplexing predicted behavior of electrons traveling through slits to numerous measurements of fundamental chemical and nuclear properties. As a single example of thousands that could be mentioned here, the numerical value of the magnetic dipole moment of the electron (in certain units), calculated from the present-day theory of quantum electrodynamics on one hand, and calculated from best available experimental measurements on the other hand, are [Sokal1998, pg. 57]: Theoretical: 1.001159652201 (plus or minus 30 in the last two digits); Experimental: 1.001159652188 (plus or minus 4 in the last two digits). Is this agreement, to within one part in 70 billion, just a coincidence? Quantum physics is the basis for chemistry, semiconductor technology and materials science, and thus has far-reaching and absolutely indispensable applications in today’s world. It is not an exaggeration to say that quantum physics underlies virtually every electronic circuit, device and system in use today, and they would quickly fail to work if these theories were even slightly in error. Standard model. In the 1970s, quantum electrodynamics (QED) was extended to what is now known as quantum chromodynamics (QCD), and, together with relativity, constitute what is known as the “standard model” of modern physics. Perhaps the most dramatic confirmation of the standard model was the 2012 discovery of the Higgs boson [Overbye2012a]. In the past 30 years other attempts have been made to extend the frontiers of physics, including supersymmetry and string theory, but so far the standard model continues to reign supreme, even though researchers recognize that ultimately either relativity or quantum physics or both must give way to a more fundamental theory. Structure of DNA. Surely the discovery of the structure and function of DNA by Francis Crick and James Watson (with assistance from several others, notably Rosalind Franklin) must rank as one of the most significant discoveries of the 20th century, and arguably the single most significant discovery in molecular biology of all time. As the two researchers modestly observed at the conclusion of their original paper, “It has not escaped our notice that the specific pairing we have postulated immediately suggests a possible copying mechanism for the genetic material.” [Watson1953; Pray2008]. The full impact of this discovery in medicine and biology is only now being realized, with the advent of inexpensive full-genome sequencing and gene editing (see below). Accelerating universe. Astronomers and physicists were startled when in 1998, two different observational teams found that the expansion of the universe, long assumed to be gradually slowing due to gravitation, was actually accelerating [Wilford1998]. This finding has enormous impact on cosmological models of the universe, and has caused considerable consternation in the field, yet latest studies continue to confirm this finding [Susskind2005, pg. 22, 80-82, 154; Amit2017]. Extrasolar planets. Following some initial discoveries by astronomers in the 1990s, astronomers have discovered thousands of planets orbiting other stars, in a development that has significant implications for the existence of life outside the Earth. As a single example of these discoveries, in 2017 astronomers found seven roughly Earth-size planets orbiting a star named Trappist-1, about 40 light-years away. At least one or two of these planets appear to have a temperature regime that would support life, although it is still much too soon to say whether or not any life actually exists there [Chang2017]. Gravitational wave astronomy. In 2016, a team of researchers operating the new Long Interferometer Gravitational Observatory (LIGO) system announced that they had detected a brief chirp, the “sound” in the fabric of the universe of two black holes colliding, as predicted by Einstein’s general relativity. This discovery heralds the start of a new era of astronomy, one where optical and radio telescopes are combined with gravitational wave detections to explore the universe [Overbye2016]. Of course, this is just the briefest summary of highlights. For every item listed above, 1000 very significant other items could have been included. Scientific progress is very real. Medical technology. Eyeglasses, from their widespread adoption in the 19th century, have restored clear vision to billions of otherwise blind or nearly blind persons. A recent analysis listed eyeglasses as the fifth most significant invention of all time, one that has “dramatically raised the collective human IQ” [Fallows2013]. Yet vision is just one detail in a huge body of medical technology, mostly developed in the 20th and 21st century, including: (a) vaccination and antibiotics, which have saved billions of persons from otherwise debilitating and deadly disease; (b) x-rays and magnetic resonance imaging; (c) surgical procedures; (c) effective painkillers and pharmaceuticals; and (d) dental procedures that have saved the teeth of billions of persons worldwide. As a result of this technology, worldwide life expectancy has soared from 29 in 1880 to 71 today [Pinker2018, Chap. 5]. Transportation. Today’s worldwide rail network, which serves a large fraction of humanity, has grown from a few miles in England, Europe and the U.S. in 1830 to millions of miles today. Even more amazing is the growth, beginning in the late 1800s and early 1900s, in highways and automobiles, with over one billion vehicles in use today [Motor2019]. Additionally, a whopping 3.5 billion airplane trips are taken each year, and although 80% of the world’s population has never flown, each year 100 million fly for the first time [Gurdus2017]. More remarkably, very likely within 25 years or so, human passengers (not just a handful of astronauts) will travel to the Moon and Mars, an achievement that only a few years ago was the realm of fantasy [Drake2017]. Firms pursuing commercial space transport include Blue Origin (founded by Jeff Bezos), Boeing, Orbital Sciences, SpaceX (founded by Elon Musk) and Virgin Galactic (founded by Richard Branson). Moore’s Law and computer technology. No other single statistic is as compelling a demonstration of technological progress as Moore’s Law, namely the observation that beginning in 1965, when Intel pioneer Gordon Moore first noted it [Moore1965], the number of transistors that can be crammed onto a single integrated circuit roughly doubles every 18-24 months. Moore’s Law has now continued unabated for over 50 years, and the end is not yet in sight. As of 2019, state-of-the-art devices typically have more than 20 billion transistors, an increase by a factor of 80 million over the best 1965-era devices [Transistor2019]. This staggering number of on-chip transistors translates directly into memory capacity and processing speed, endowing a broad range of high-tech devices with capabilities unthinkable even a few years ago. For example, 2019-era supercomputers compute one million times faster, and include one million times as much memory, compared to supercomputers just 25 years ago [Top500]. With technologies such as nanotechnology and quantum computing in development, even more futuristic applications are in the works. Communication. Human society leaped forward in the 15th century with the printing press, which provided public access to many literary and scientific works and directly contributed to the birth of modern science. Similarly, the development of the telegraph and telephone facilitated the huge technological boom of the 19th and 20th century. Now we are seeing the effects of an even more far-reaching communication revolution, namely the Internet, which quite literally brings the entire world’s cumulative knowledge to one’s computer or smartphone. Some of the older generation may recall when telephone service was first provided to individual homes, via “party lines,” back in the 1930s, 1940s and 1950s. Long-distance calls were possible, but only at very high rates — typically 50 cents to $1.00 per minute within first-world countries, and $3.00 to $5.00 per minute to foreign countries. Nowadays, via the Internet and services such as Apple’s FaceTime and Microsoft’s Skype, one can communicate by high-resolution color video, for free, to virtually anywhere worldwide. Smartphones. No first-world teenager needs to be lectured about the miracle of a smartphone, which quite literally connects nearly the entire world’s population in a communications network, provides full access to Internet resources and includes a GPS mapping facility that by itself would astound anyone of an earlier era. As of 2019, over five billion persons, or roughly 70% of the entire world population, own at least a cell phone, and 2.71 billion, or nearly half the world’s population, own a smartphone [Smartphone2019]. As of 2019, state-of-the-art smartphones typically include touchscreens with over three million pixel resolution, at least two cameras with over ten million pixel resolution, and up to 512 Gbyte storage. Beginning with the 2018-2019 models, Apple smartphones also include special hardware and software that enable 3-D facial recognition. Today’s leading-edge smartphones can perform more than five trillion operations per second, a speed faster than that of the most powerful supercomputers of twenty years earlier. Now many of these same smartphone capabilities are being delivered in smartwatches, with built-in wireless facilities, GPS mapping and features for monitoring health and fitness. For example, beginning with the 2018-2019 models, Apple watches can produce a clinical-quality electrocardiogram and can automatically call emergency services if it detects that the wearer has fallen and was not able to get up. Genome sequencing. The first complete human genome sequence was completed in 2000, after a ten-year effort that cost approximately $2.7 billion [Genome2010]. But in the wake of several waves of new technology since then, genomes can now be sequenced for less than $1,000, and the cost is expected to drop to only $100 by 2020 or so [Vance2014; Fikes2017]. If the $100 price is achieved by 2020, as expected, the price will have dropped by a stunning factor of 27 million in only twenty years. This is sustained progress by a factor of 2.35 compounded per year, which is significantly faster than the Moore’s Law rate of 1.59 compounded per year. Partial genome sequencing is already wildly popular as a means to identify the national origin of one’s ancestors, and full genome sequencing is being used to identify possible genetic defects. It is inevitable that full genome sequencing will become a standard part of modern medicine in ways that we can only dimly foresee at the present time. What’s more, this same sequencing technology has enabled biologists to study the genomes of thousands of other biological species, producing indisputable evidence of common ancestry between species. In the latest application of DNA technology, researchers have discovered a technique for gene editing (“CRISPR”), a development that is certain to have far-reaching applications in medicine and almost certainly will merit a Nobel Prize [Zimmer2015c]. Artificial intelligence. Although the notion of artificial intelligence (AI) was first articulated by 1950, early optimism soon faded as researchers realized that AI was very much more difficult than first envisioned. In 1997, in a seminal event for the field, an IBM computer system defeated the world’s champion chess player. In 2011, in a much more impressive AI achievement, an IBM computer named “Watson” defeated two champion contestants on the American quiz game Jeopardy. In 2017, a computer program developed by Google’s DeepMind defeated the world champion Go champion, an achievement that many had thought would not come for decades, if ever. Then later that year, in an even more startling development, DeepMind researchers developed a new program that was merely taught the rules of Go, and then played against itself. Within just three days it had exceeded the skill of the previous program; similar programs then quickly conquered chess and the Japanese game shogi as well. This same AI-machine learning approach is now being applied in numerous commercial developments; indeed, 2018 appears to be the year that AI truly came of age. Among the current participants are Amazon, Apple, Facebook, Google, IBM, Microsoft, Salesforce, and numerous financial firms [Bailey2018]. Closely related is the development of self-driving automobiles and trucks. Waymo has already launched a robot-ride taxi service in Arizona [Davies2018], and self-driving trucks will likely be fielded by 2022 [Freedman2017]. At the same time, and in spite of continuing naysaying from both the left wing (in particular, the postmodern science studies movement) and the right wing (in particular, the creationism, intelligent design and climate change denial movements), the engine of scientific and technological progress continues unabated. Just in the past 20 years, scientists have discovered that the universe’s expansion is accelerating, have discovered thousands of planets orbiting other stars, and have catalogued the entire human genome. The latter task cost roughly $2.7 billion when it was completed in 2000, yet dramatic improvements since then have reduced the cost to roughly $1,000, and it will soon fall to $100. 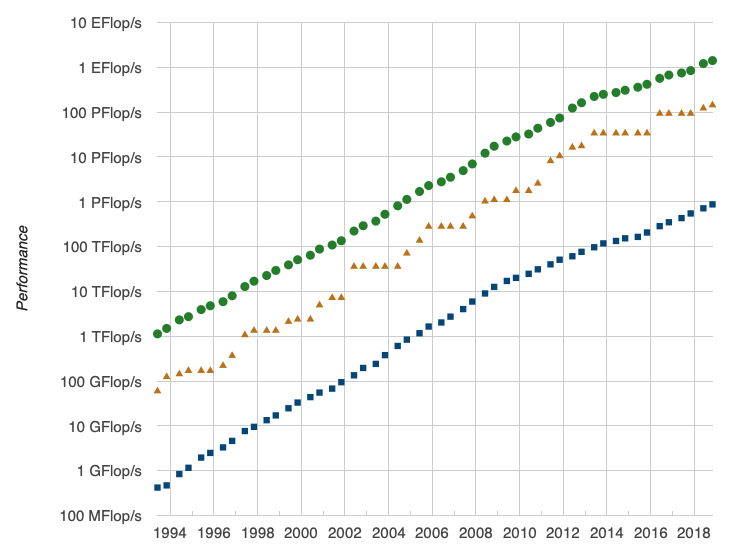 Computer and information technologies continue their relentless advance with Moore’s Law. This is perhaps most evident when we see the vast numbers of cell phones and smartphones now in use — more than 5 billion, or roughly 70% of the entire world human population, now own at least a cell phone, and 2.7 billion own a smartphone. The latest smartphones pack worldwide communication, full-fledged Internet facilities, voice recognition, facial recognition and GPS mapping, and feature computing power exceeding the world’s most powerful supercomputers of just 20 years ago. And technologies such as genome sequencing, artificial intelligence, self-driving vehicles and commercial space travel are just getting started. There is no sign that this torrid rate of progress is slowing down — in 20 years hence we will look back to our own time with just as much disdain as we do today when we recall the world of 20 years ago. So we have much to look forward to. The future is destined to be as exciting as any time in the past. It’s a great time to be alive.